Some students of the Massachusetts Institute of Technology developed a rope climbing device that is able to carry 250 pounds, moving up the rope at 10 feet per second. Not quite impressed? Imagine that the little gizmo will be able to reduce the time that a fire-fighter needs to reach the top of a 30-story building from 6 minutes to just 30 seconds. The key insight to build the rope climber was based on the idea of wraping the rope around a cylinder with many turns, which increases the grip strength drastically without damaging the rope. The students founded a company called Atlas Devices, and they already have a contract to supply the U.S. Army. hi i need a help..im a student in mechanical eng. 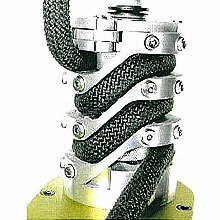 n i need to design a device tat cal ‘ rope climber’ tat can climb the rope without any load… can u give me any suggestion….